I'm sure you can tell that the last few posts have all been from the same night. 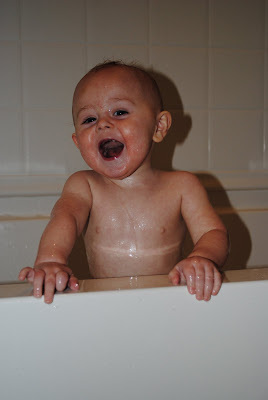 I can't help myself, but I just love bathtime and bathtime pictures. 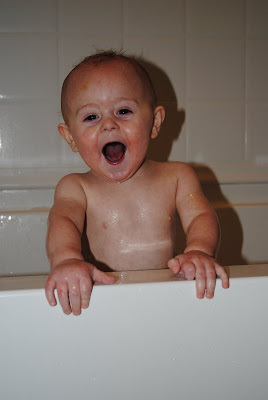 As you can probably see, Aidyn also LOVES his bathtime! 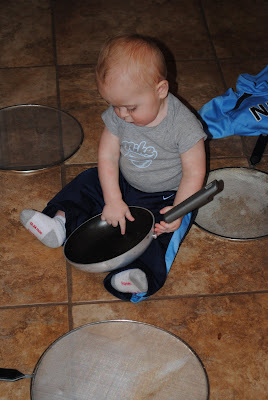 Tonight we had chicken and dumplins for dinner. 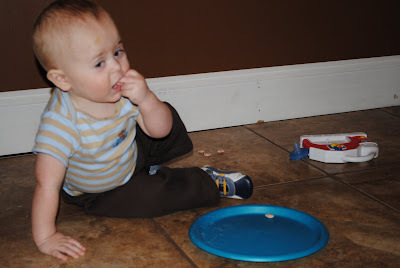 He fed himself (finger food) chicken, dumplins, and biscuits. 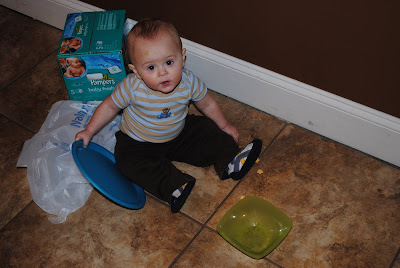 By the time we were done eating, he had to go straight to the bathtub...he had food EVERYWHERE! But he ate it and enjoyed it, so that's all that matters...right? My mom came over last week and brought dinner...and we had the same situation. 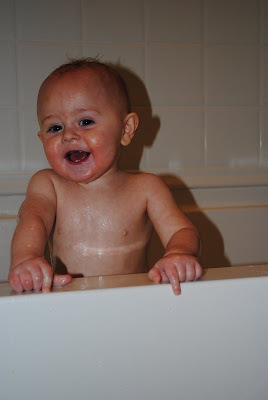 Potato everywhere which meant a trip straight to the tub. And no worries...I've got pictures of both incidents that will be posted (eventually, ha). When we first bought our house, we always talked about our "ghost". We had weird thing happen that freaked me out such as lights flicking off and on, strange noises, and on a few occasions - our dog would crouch backwards, back up against the headboard of the bed, her hair would raise on her back, and she would growl like crazy. It DEFINATELY was scary! Luckily, since we've finished most of our remodeling, we haven't had anymore incidents in a few years. I always remind myself that "our ghost" is just being nice because she's happy with all of the beautiful improvements we've made. ;) And don't worry, I'll keep telling myself that, hahaha. 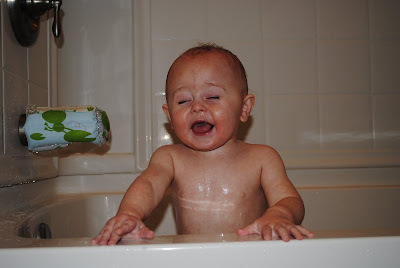 However, Aidyn was in the bathtub the othernight playing and he kept laughing and making silly faces. So I grabbed my camera to take some pictures. 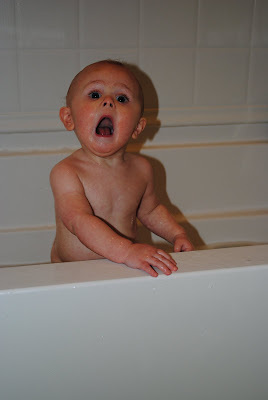 I somehow got a snap of his face as he was screaming and making noises. As I showed my mom the picture she said, "Looks like he saw a ghost." Now that I look back at the picture, it really does! I sure hope he didn't see a ghost! "No, Mommy. I'll do it!" 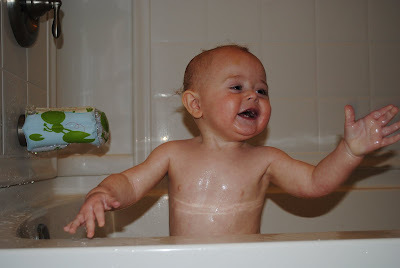 Aidyn used to enjoy filling his cup with water and drinking the bath water. I always use a cup to rinse him off, and when I'm not using it, he is usually playing with it. 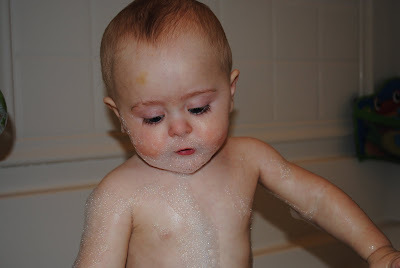 Mmm, those bubbles are tasty! He's so funny beccause as he tries to carefully lower his face down in order to "eat" the bubbles, he almost always ends up with his face (nose and mouth) under the water and he gets choked. He'll cough with watery eyes and then turn around and try again. I shut the dishwasher and started on dinner. 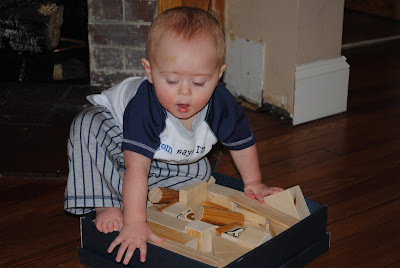 Aidyn enjoys playing with his homemade wooden blocks that his Granpa Gary made him for his birthday. 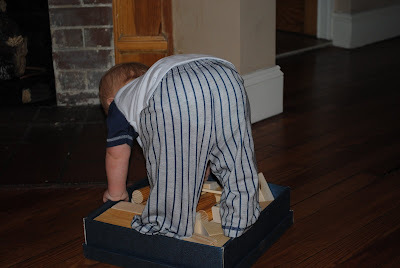 One of his favorite thing to do, which I'm not rea sure why, is to try and situate himself onto the box and sit. ...but he doesn't give him. He keeps on trying. And eventually he gets his entire body in or on the box, haha. 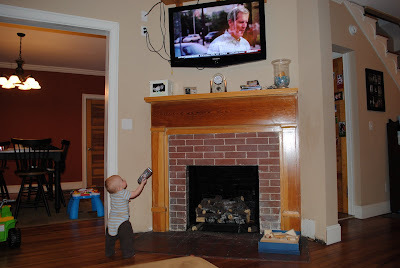 As I gave in one night (when we were home alone, and he was cranky), I watched Aidyn take the remote control and walk over to the TV. Our TV is mounted on the wall, up above our fireplace. 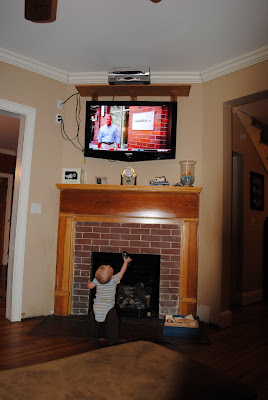 Until recently, he hasn't payed much notice to the TV. But apparently, he knows exactly what the remote is meant for. 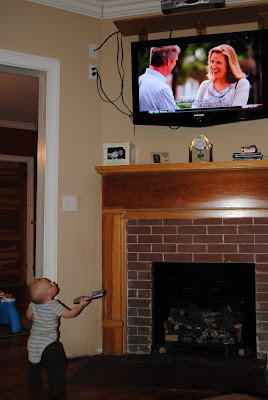 As he quit crying and was excited walking across the room, I was in shock as he walked over to the TV, lifted the remote as if to point it at the TV, and began talking away as though he was trying to change the channels. I could quite laughing and jumped up to grab my camera as quickly as possible. 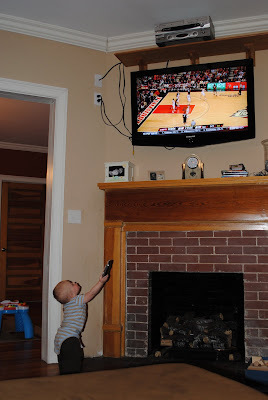 Needless to say, since we're canceling our digital cable this weekend and installing dish...we've been letting him play with the remote all he wants. He continues to suprise us and make us laugh each day! 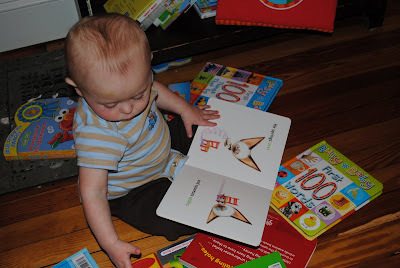 So, I realize that this is like my 100th post of Aidyn reading...but I just can't resist. I'm not sure if it's because I'm a reading teacher, because I love reading children's picture books, or because of all the information I've read lately about children reading at an early age. In case you didn't know, I started back to school in August to work on my Master's Degree. My degree is focused on "Teaching Reading" and being a "Reading Specialist". 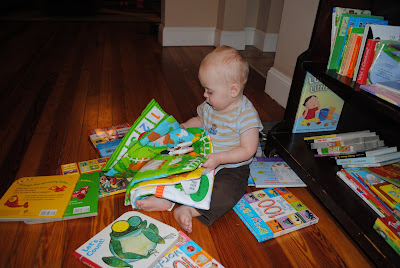 In our last 2 semesters, we've read lots of materials on the impact that books have on children. Just the access and "experience" of books as a young child is a HUGE indicator of a child's success as a reader and student. Because Aidyn LOVES his books, I'm constantly buying board books (made of thick cardboard) anytime I see them. It really is an addiction I think, haha. But just like tonight, when he plays at his bookshelf, grabs a book and comes running to me, climbs on my lap and plops down with his book...my heart melts and I just HAVE to read it to him. Tonight we read The Foot Book 3 times, Sesame Street Firehouse 2 times, and Look, Look! several times. Each time he'd throw the book to the side, return to his bookshelf for another book, and come walking back grinning from ear to ear "talking" about his new book. The other night Aidyn and I went to the grocery store, which we do quite frequently. He loves riding in the buggy, seeing all of the people, and helping me "hold" the items we pick up. 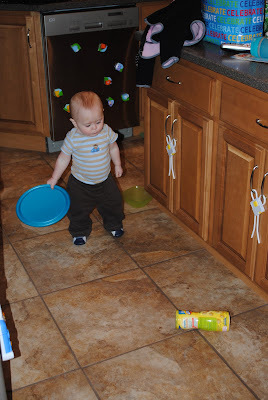 When we returned home the other night, I decided to give him a few snacks while I tried putting the groceries away. 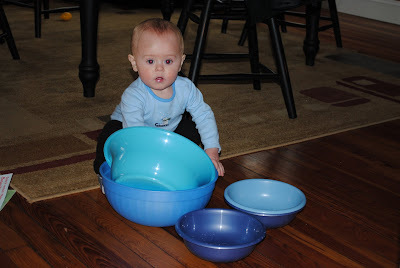 First, I tried a bowl. He didn't like that. 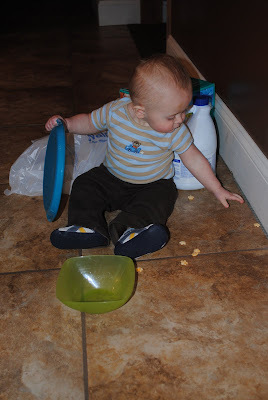 He wanted them on the floor, I guess, since he picked the bowl up, turned it over and dumped them out all over the floor. 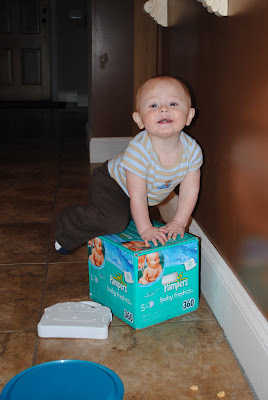 Next, I tried sitting the bowl on his box of wipes so it'd be more at his level. Nope. 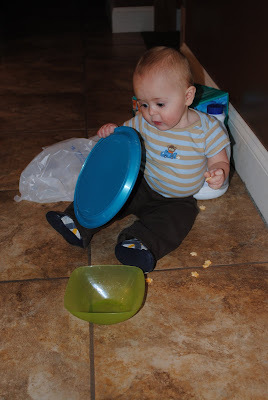 He picked it up, dumped them out, took a quick pose, and then sat in the floor eating. Soooo, then I tried a plate. 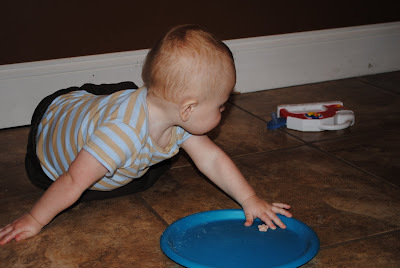 I thought maybe the plate would be flat, so he'd leave them on it and eat off the plate (but in the floor). Wrong, again. 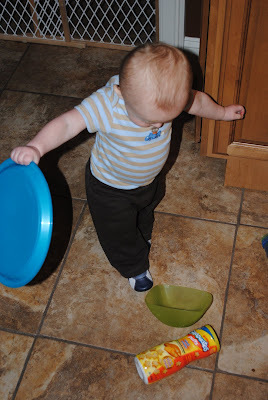 He picked up the plate, turned it over, and dumped them out. So...I quit trying. 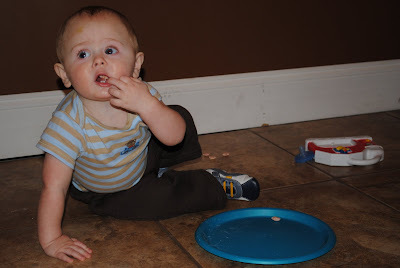 :) I simply made sure the floor was clean, scoot his pieces over to the side so neither of us would step on them and let him eat off the floor. 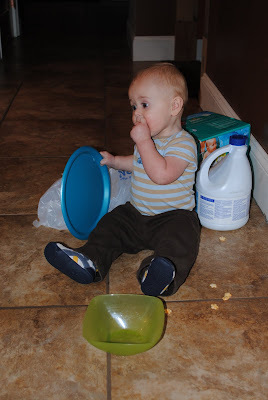 *Let me clarify that he was picking them up off the floor, not actually eating with his mouth like an animal would. Thank goodness! 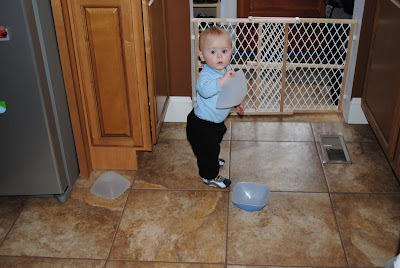 It's probably been a month since Aidyn realized he could open the tall cabinet next to the refridgerator and access all of our plastic bowls, both big and small. 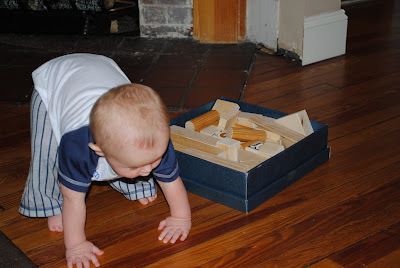 He sense has made it a routine thing to pull them all out and carry them around the house playing. 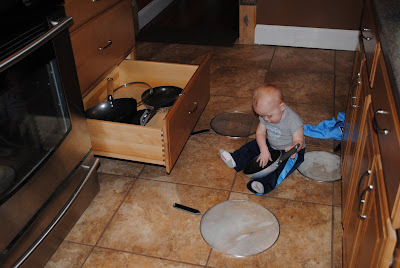 He just recently noticed that in the bottom of the cabinet we keep all our styrofoam plates, napkins, etc. 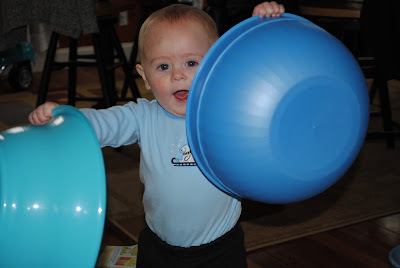 He now likes to also pull those and make a mess with them too. I would try to put them somewhere where he couldn't reach them...but who's he hurting? 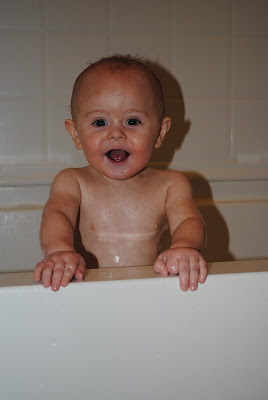 Now that I've finally figured out how to actually make our family blog private, ha, I will be doing so this week. I know of a few people that asked me to add you to our blog list, but I can't seem to find your emails. PLEASE email me at witme_01@yahoo.com so that I can add your email list to our "allowed viewers" list. I know what you're probably thinking, "It's about time!" *I'm now trying to decide if I want to do "monthly" posts with a few of our favorite pictures from each month, or just continue doing individual posts. I haven't decided. Due to time and schedules, I'd rather do monthly posts. However, we have some really cute pictures of different events that would be easier to post by "theme". Time will tell, I guess. More fun in the ball pit, chewing on his shoes. Climbing out on his this time, no help. He did great, ha! Aidyn loves his chair for many reasons. 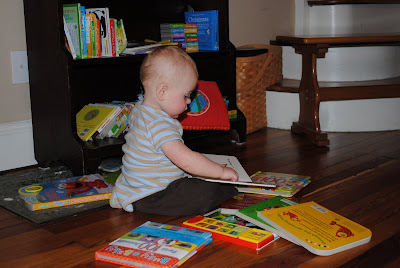 He can sit and read his books, stand and look out the side porch door, or climb up onto the loveseat. 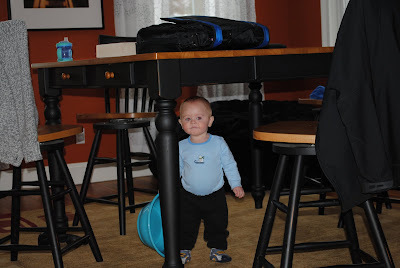 He now knows how to climb up onto the chair and over to the loveseat armrest, up and over, and onto the loveseat. 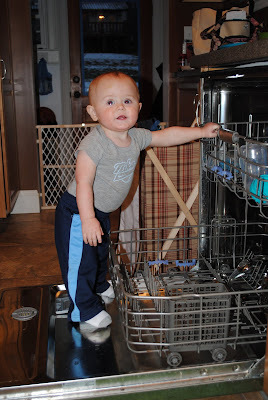 He is definately a climber...which has turned out to be not so good. He now has decided he also wants to climb UP his bookshelf. The bottom shelf is about 2 inches off the ground. 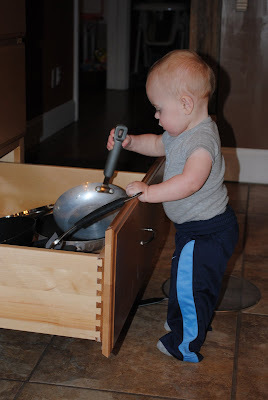 He can stand on it, hold on to the 3rd shelf while trying to pull his knees up onto the middle shelf. Not a good thing, at all! 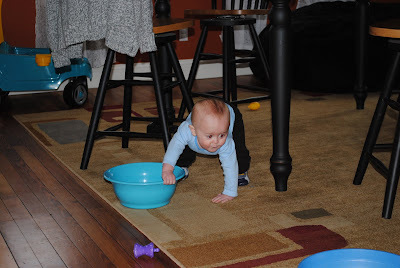 We are constantly telling him no and trying to "redirect" him, but just turns around and runs back. Hopefully we can break him of this habit SOON. Aidyn's uncle Thomas and Lesley bought Aidyn a ball pit for his birthday. He played in it all afternoon and I was able to get some great shots of him. ...so he took a ride around the house while he waited. Everyone else watching basketball while the ball pit is blown up. ...or how to climb in. Thank you, Thomas and Lesley!